I’ve put together a list of the 32 movements in the standardized short sword form. The contemporary forms have two sets of names, descriptive and traditional. Descriptive names are instructions, like Feet Together Point Sword. The traditional names are mostly poetic, often idiomatic, and sometimes make reference to folklore and legendary gods and heroes. For descriptive names, I have used the list written out for me by a friend (below). For the traditional names I have relied heavily on Michael Garofalo’s excellent blog, Cloud Hands. He has compiled an extensive list of names for each movement–these older names appear in many forms and have numerous translations. I have chosen the poetic names used at my school for the Yang sword form. 起势, Qi Shi (Commencement) is not one of the 32 movements. For 32-sword, 三環套月 (San huan tao yue) is a form of Three Rings Around the Moon, which also varies in traditional forms, but is mostly the same in contemporary sword forms. If you are confused by the two different names for Da Kui Xing—Big Dipper and Major Literary Star—Michael Garofalo explains how and why the great scholar Kui Xing took up residence in the constellation. See Cloud Hands. Interestingly, the MDBG dictionary translates 海底撈月 (Hai Di Lao Yue), which we call Scooping the Moon from the Bottom of the Sea, as an idiom for a hopeless illusion, which makes sense, since the moon in the sea is just a reflection that you couldn’t scoop up. Push Boat with Current is an idiom for taking advantage of a situation for one’s own benefit, and Shooting Star Chases the Moon is an idiom for swift action. Heavenly Horse Crosses the Sky ia an idiom for boldness and imagination, unrestrained style, especially in calligraphy. Garofalo notes that a number of words for sword techniques are also terms for strokes in calligraphy, and that many sword masters have also been accomplished calligraphers. The next full minute of the form consists of ten moves straight out of 32-sword, so maybe this is a good time to review. The movements all have both descriptive and traditional (or poetic) names. Which I’d like to hook up. My translations of the descriptive terms leave much to be desired. I don’t really care—why translate? Why not use the Chinese names? The first seven are exemplified in 32-sword. Master Zhang (first link above) provides good descriptions of how all of them work as applications of sword forms. I am wondering how liao, gua, and sao fit in. Also, is lan just a synonym for ge or jie? From Tao of Tai Chi, I’ve also found a list of techniques for the Tai chi broadsword: upper cut, under cut, cross cut, chop, split, lift, stab, block, pull coiling, push, intercept and parry. Names of movements can be either poetic or descriptive, and in the case of 32-sword, there are two completely different lists of the same routine. The list I gave in an earlier post on 32-sword is useful because so many of the movements also occur in the traditional and the standardized long sword forms. 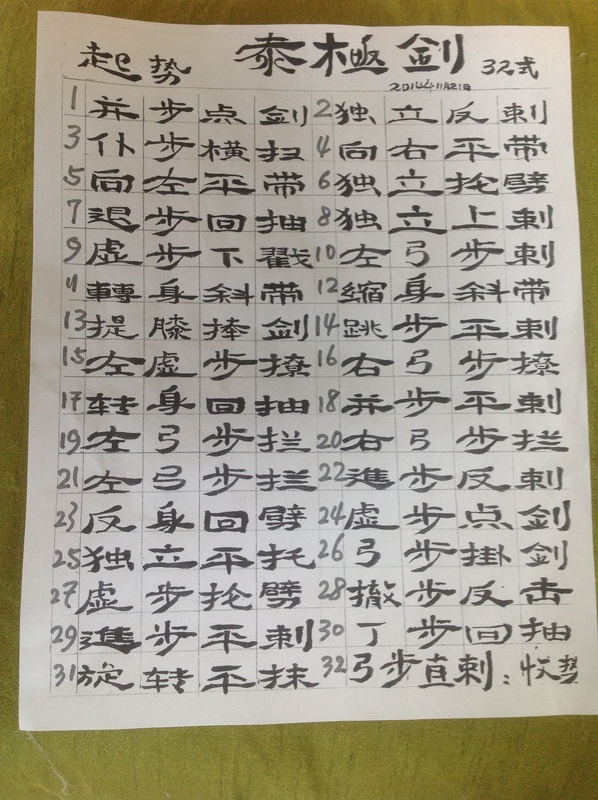 However, I’m trying to learn the descriptive list–in Chinese–because these are the names that my Chinese friends use. They are also the names called out in the music we use. 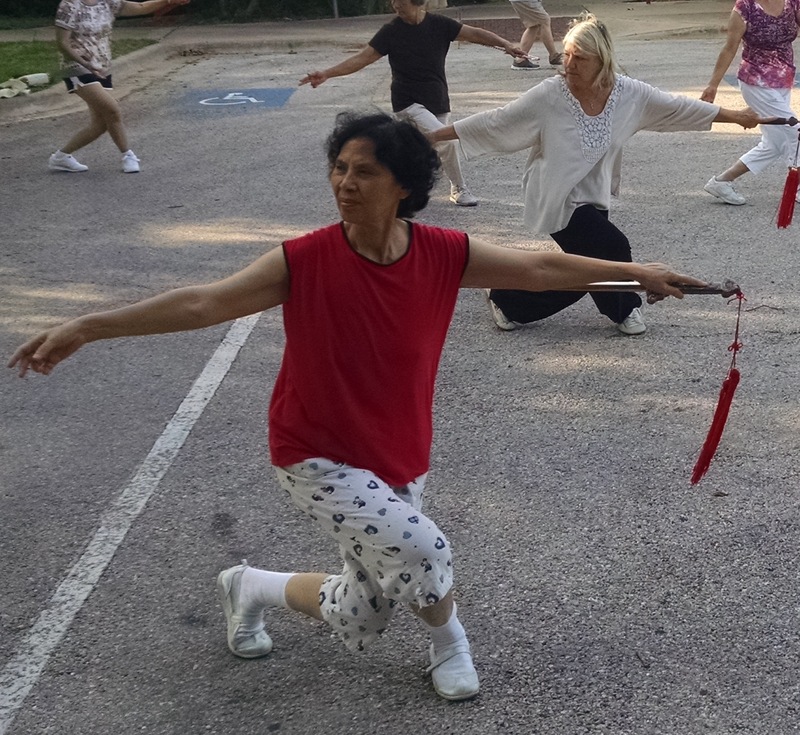 Here’s a nice web page: Tai Chi Central offers both lists in English. But I need Chinese. And not just any Chinese version (such as I might generate with a dictionary), but the one my friends use. Luckily, they’ve given me this beautiful written transcript (above). Working out the correct Pinyin from these characters has been a most entertaining exercise! I’m almost there. Below, the English is not word for word; I’ve rendered it a little more idiomatic. The Tai Chi Central page helped with this. This is all a little backwards, in that the names aren’t helping me learn the form; it’s because I know the form that I can figure out the names! But if I can understand the names in Chinese, I can follow the music. Right? *This is what you do; cannot make sense of the characters or the Pinyin! This short sword form is a simplified version of the standardized 56-sword–simplified just in being shorter. All the movements in 32-sword are also in 56-sword. Michael Garfalo (Valley Spirit Taijiquan, Green Way Research, Red Bluff, California) offers an illustrated list of movements on his website. He also offers a PDF with drawings, but although this seemed like a great idea, I found it impossible to follow. Learning from video is hard enough! Luckily, I have Long Feng–nothing is better than a good teacher.